Years that add up to #3 are represented by the Empress. Compassion, nurturing and all things maternal are highlighted during the Empress year. If you’re not actually birthing children, you’ll likely be busy birthing new creations in the form of art, food or music, anything that inspires the senses. This is a year of sensuality and when you focus on your task, an unusually prolific one. Kindness will likely draw wayward souls your way and it will feel right to do your best to help them all. Enjoy the company of women, they’re especially on your side when the Empress is around. 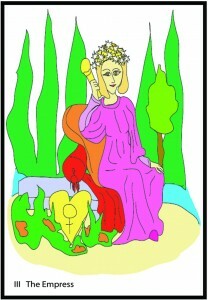 The Hanged Man and Universe are the shadow symbols for the Empress. § 2 Responses to Growth Year #3 – The Empress"